April 29, 2017 – VPW: Karen Q (c) vs. Kris Stadtlander. If anyone knows the match result for this, drop us an email. June 10, 2017 – VPW: Kris Stadtlander defeated Karen Q in a no disqualification match to win the women’s title. September 8, 2017 – CAP: Kris Stadtlander defeated Izzy McKenna and Kasey Catal in a 3-way match. September 22, 2017 – FBW: Kris Stadtlander defeated Katred. September 30, 2017 – NYWC: Willow Nightingale defeated Kris Stadtlander to retain the Starlet title. October 11, 2017 – CZW Dojo Wars: Maria Manic defeated Kris Stadtlander. October 27, 2017 – CAP: Kristen Stadtlander defeated Nikki Addams. October 28, 2017 – VPW: Kris Stadtlander defeated Antoinette Marie and Karen Q in a 3-way match to retain the women’s title. November 1, 2017 – CZW Dojo Wars: Stephon Pennington defeated Kris Stadtlander. November 18, 2017 – WrestlePro: Rosemary defeated Kris Stadtlander. December 8, 2017 – WrestlePro: Sienna defeated Kris Stadtlander. January 12, 2018 – BCW: Faye Jackson defeated Kris Stadtlander. January 13, 2018 – VPW: The Grammar Cop defeated Jacob Hendrix, Kris Stadtlander and Razzle Dazzle in a 4-way, elimination 1st round match of the King Of New York tournament. Antoinette Marie and Karen Q defeated Kris Stadtlander and Sam L’Eternal. January 19, 2018 – Limitless: Allie Kat, Ashley Vox and Kris Stadtlander defeated The Maine State Posse (Aiden Aggro, Alexander Lee and The DangerKid). January 20, 2018 – CAP: Izzy McKenna and Nikki Addams defeated Kasey Catal and Kristen Stadtlander. January 28, 2018 – WWR: Kasey Catal, Kris Stadtlander and Vanity defeated Alexxis, Gilian Leigh and Taeler Hendrix. February 24, 2018 – Blitzkrieg Pro: Bobby Orlando defeated Connor Braxton, Kai Katana, Kristen Stadtlander and Spore in a 5-way match. March 10, 2018 – VPW: Kris Stadtlander defeated Sam L’Eterna retain the women’s title. March 24, 2018 – WWWA: Kristen Stadtlander defeated Corinne Mink to retain the women’s title. March 25, 2018 – WWR: Davienne defeated Kris Stadtlander. March 30, 2018 – LW: Ashley Vox defeated Allie Kat, Kris Stadtlander and Penelope Ford in a 4-way match. April 13, 2018 – CAP: Kris Stadtlander and VSK defeated Jeremy Leary and Skylar. April 28, 2018 – VPW: Kris Stadtlander defeated Sam L’Eterna retain the women’s title. May 12, 2018 – UPWA: Corinne Mink defeated Kristen Stadtlander and Terra Calaway in a 3-way match to win the women’s title. May 19, 2018 – VPW: Max Caster and Sam L’Eternal defeated Kevin Tibbs and Kris Stadtlander. June 9, 2018 – CAP: Kris Stadtlander defeated Katarina Leigh. June 16, 2018 – WSU: Kasey Catal defeated Kris Stadtlander. June 23, 2018 – VPW: Sam L’Eterna defeated Kris Stadtlander to win the women’s title. Kris Stadtlander defeated Sam L’Eterna win the women’s title. June 29, 2018 – CZW: The Shook Crew (Bobby Orlando & Bryce Donovan) and Kris Stadtlander defeated Brandon Kirk, DJ Hyde and Kasey Catal. July 7, 2018 – UPWA: Corinne Mink defeated Kris Stadtlander to retain the women’s title. July 14, 2018 – WWR: Kris Stadtlander defeated Karissa Rivera. July 21, 2018 – VPW: Kris Stadtlander defeated Antoinette Marie and Sam L’Eterna in a 3-way match to retain the women’s title. July 29, 2018 – AML vs IMPACT Wrestling: Tessa Blanchard defeated Allie and Kristen Stadtlander in a 3-way match. August 5, 2018 – CAP: Kris Stadtlander defeated Terra Calaway. August 11, 2018 – LW: Kris Stadtlander defeated Delmi Exo. August 26, 2018 – WWR: Maria Manic defeated Kris Stadtlander. September 22, 2018 – VPW: Masha Slamovich defeated Kris Stadtlander to win the women’s title. September 29, 2018 – ROH TV (Taped): Jenny Rose, Stella Grey and Tenille Dashwood defeated Ashley Vox, Kris Stadtlander and Riley Shepard in a dark match. September 30, 2018 – Beyond Please Come Back: Kris Stadtlander defeated John Silver. October 19, 2018 – WrestlePro: Corinne Mink defeated Kristen Stadtlander. October 27, 2018 – VPW: Kris Stadtlander defeated VSK. October 31, 2018 – Beyond It’s Alive: Kris Stadtlander defeated Matt Cross. November 30, 2018 – LW: Kris Stadtlander defeated Penelope Ford. December 1, 2018 – LW vs. Blitzkrieg Pro: Mark Sterling defeated Kris Stadtlander by disqualification. December 8, 2018 – CAP: Ariela Nyx defeated Kris Stadtlander. December 15, 2018 – HOG: Sonya Strong defeated Kris Stadtlander to retain the women’s title. December 28, 2018 – LVAC: Team Sea Stars (Ashley Vox and Delmi Exo) defeated Kris Stadtlander and Riley Shepard. December 30, 2018 – Beyond Tournament For Tomorrow: Kris Stadtlander defeated Kylie Rae. December 31, 2018 – Beyond Heavy Lies The Crown: Kris Stadtlander defeated Maxwell Jacob Friedman. January 11, 2019 – LW: Ashley Vox defeated Kris Statlander in a unsanctioned rules match. January 18, 2019 – BCW: Kris Statlander defeated Brandi Lauren and Delmi Exo in a 3-way, 1st round match. Faye Jackson defeated Aja Perera, Kris Statlander and Tasha Steelz in a 4-way match to win the tournament and vacant women’s title. January 24, 2019 – GPW/Beyond To Greektown & Beyond! : Alexia Nicole vs. Kris Statlander ended in a double count-out. January 25, 2019 – C4: Evil Uno defeated Cecil Nyx, James Stone, Mark Wheeler, Seleziya Sparx and Kris Statlander in a 6-way match. January 26, 2019 – NYWC: Willow Nightingale defeated Kris Statlander. February 2, 2019 – BLP: Kris Statlander defeated Bear Bronson. February 16, 2019 – PWM: Ariela Nyx defeated Kris Statlander to win the vacant women’s title. February 17, 2019 – CAP: Kris Statlander defeated Ariela Nyx. 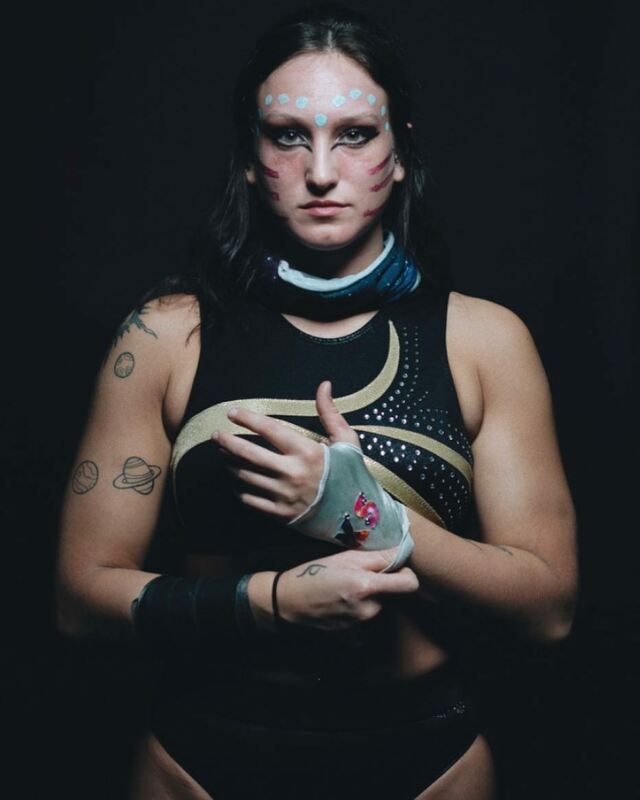 February 22, 2019 – C4: Kris Statlander defeated Allysin Kay and Mercedes Martinez in a 3-way match. February 23, 2019 – NYWC: Team Bull James (Brad Benson, Bull James, CJ Benson, Kris Statlander, Mouse and Rex Lawless) defeated The Culture (King Mega (c), Brandon Watts (c), Dave McCall (c), Nate Carter (c), Chris Bishop and Willow Nightingale in a psycho circus match where all titles changed hands. February 23, 2019 – WWR: Kris Statlander defeated Lisa Marie Varon. 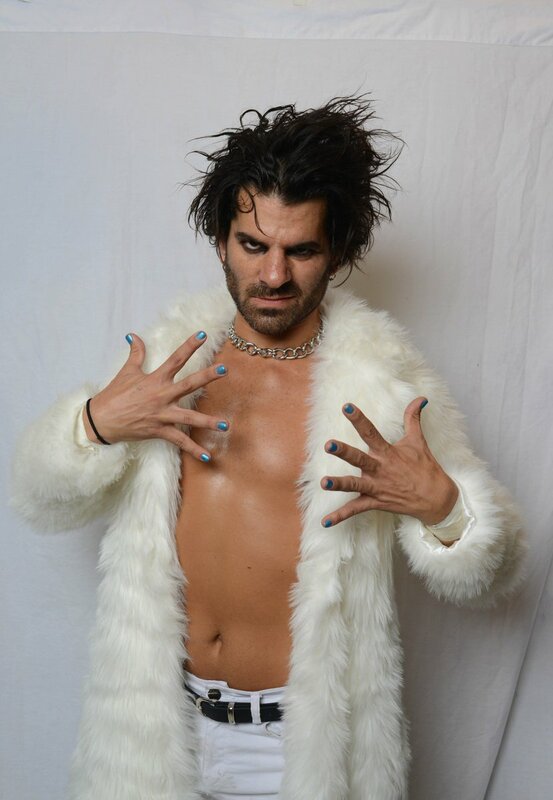 February 24, 2019 – Beyond Treasure Hunt: Kris Statlander defeated David Starr in the 1st round. Kris Statlander defeated Jordynne Grace in the semi-finals. Kris Statlander defeated Chris Dickinson to win the tournament. March 2, 2019 – CZW: Kris Statlander defeated Jordynne Grace to win the WSU Spirit title. March 15, 2019 – CW: Tasha Steelz defeated Kris Statlander to retain the women’s title. March 16, 2019 – QOC: Jordynne Grace defeated Kris Statlander to retain the PROGRESS women’s title. March 23, 2019 – WSU: Kris Statlander defeated Savanna Stone to retain the Spirit title. March 29, 2019 – CW: Tasha Steelz defeated Kris Statlander to retain the women’s title. March 31, 2019 – ROH To G1 Supercard: Kris Statlander and Tasha Steelz defeated Gabby Ortiz and Karissa Rivera & Jenny Rose and Sumie Sakai in a 3-way tag team match. April 3, 2019 – Beyond Uncharted Territory: Episode 1: Kris Statlander defeated AR Fox. April 5, 2019 – SHIMMER Volume 113: Allysin Kay defeated Kris Statlander. April 6, 2019 – GCW: Allie Kat defeated Kris Statlander, Saraya Knight and Shotzi Blackheart in a 4-way elimination match. April 6, 2019 – WSU vs WrestlePro: Kris Statlander (c) [WrestlePro] defeated Leyla Hirsch [CZW] to retain the WSU Spirit title. April 6, 2019 – HOG: Kris Statlander and Nikki Addams defeated Sonya Strong and Violette. April 9, 2019 – WWE SmackDown Live: The IIconics (Billie Kay and Peyton Royce) defeated Kristen and Karissa to retain the WWE women’s tag team titles. 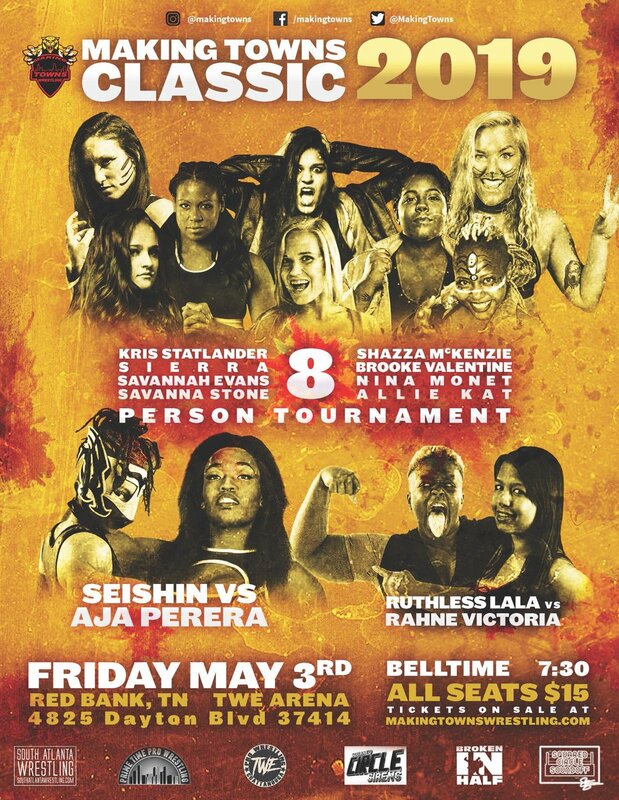 The 2019 Making Towns Classic comes to the TWE Arena on Friday, May 3 in Red Bank, Tennessee.